← Tagged: Thank you sir, may I have another? Roast your own, roast your own. 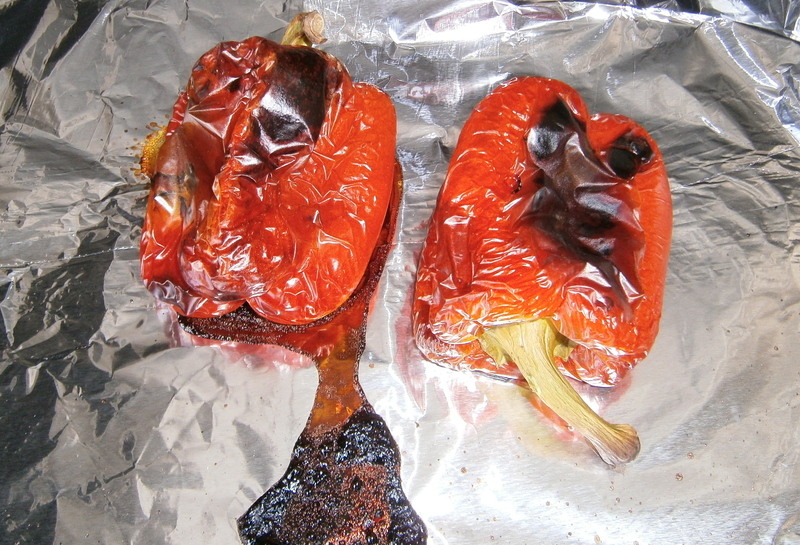 Freshly roasted peppers are a staple in my kitchen. You can throw ’em in a salad, eat ’em with pasta or grind ’em up for soup. They’re also delicious on sandwiches or with fresh mozzarella for lunch. Sure you can buy them in jars at the market, but they always seem to have vinegar in them and they never taste good. And anyway why would you buy something nasty that’s so easy to make and tastes infinitely better when you do? Now, I must point out that this does not apply to green peppers, aka the bane of my existence. They’re so low on my list of edible foods, that come the apocalypse, if I have to choose between eating a green pepper and scurvy, I may have to let go of a few teeth. 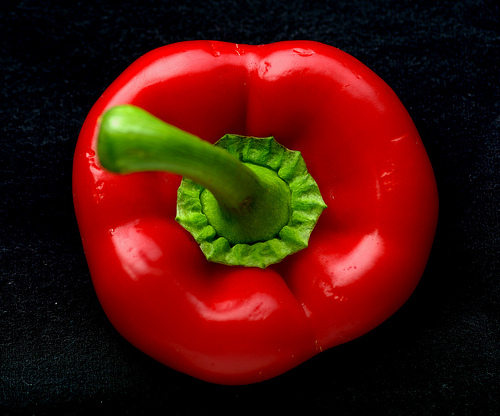 Warm-colored peppers, on the other hand, are among my favorite vegetables. Many years ago I was staying with the Great Niçoise, Chris Hodgkins, when I spied what I thought were small steaks of some kind marinating in olive oil in a dish on the counter. Still in thrall to some lingering Fifties-era germ phobias, I fearfully inquired as to her plans for the contents of the dish, fully expecting to face a dinner plate of Steak Tartare, which I knew to be among her favorites. After she finished guffawing, my hostess informed me that they were not beef fillets, but red peppers that had been roasted and were awaiting a salad to make them complete. She then, very kindly, showed me how to make them. Et maintenant, I’ll tell you. All you really need to do is get some whole bell peppers in contact with some intense heat until the skins blacken and blister. You can throw a few on the grill when cooking out (just turn them occasionally). Some people even set them on a stove burner and let a low flame do the rest, but that tends to make a mess and as I may have mentioned, when it comes to me and open flames…well let’s just say I’ve been urged by the local fire marshall to abstain from that kind of activity. Roasted up. Burned black ooze contained. I prefer to just bake them in a 450 degree oven for about half an hour to fifty minutes, or until much of the skin is blackened and loose. You can set them directly on an oven rack, but they tend to ooze while cooking and you’ll have to scrape the burned stuff off the oven floor and the racks later, and really, who wants to do that. To avoid a mess, I set them on a foil covered cookie sheet and then toss recycle the foil when they’re done. Nothing to wash, scrape or extinguish. Perfect. Blackened, loose and cool enough to peel. Once the peppers are out of the oven, let them cool until you can handle them. Just get rid of all the innards. Pull off the stem and open the pepper up. Remove the membranes and seeds. 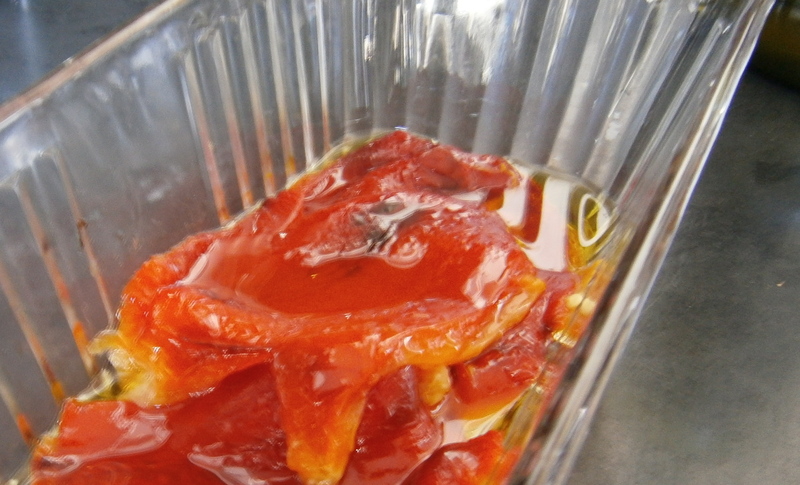 Lay the peppers in a dish and drizzle them with olive oil. NEVER vinegar! They can sit covered on the conter for several hours as long as it’s not stinking hot in your kitchen. You can use the leftover pepper-infused oil to make salad dressing, flavor sauces or as a dip for your baguette. 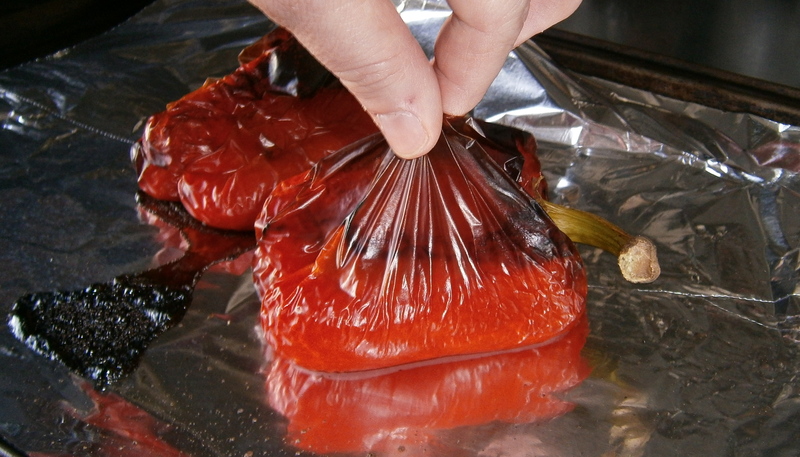 If you have leftover peppers, you’ll need to refrigerate them. I’d suggest using them within a day or two. Posted on February 28, 2012, in Dinner, Good to know, Salads, The easy way and tagged Bell pepper, Drink and Food, Humor/Commentary, Olive oil, Recipe, Roasted peppers, Roaster peppers, Salad, Vinaigrette. Bookmark the permalink. 13 Comments. 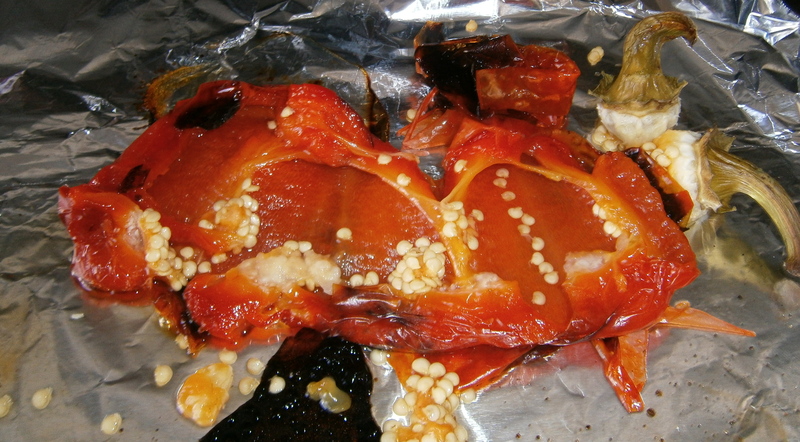 We roast peppers all the time in our house….oh so good. One thing we do differently is “sweat” the peppers in a brown bag after roasting. I’ve heard of that, but never tried it. As you may have noticed I’m all about cutting corners. How does it help? — on the off chance I might be inclined to extend myself sometime. That’s probably how you get the soul into the pepper. Best not to question. I don’t know if that was your inspiration, but either way I enjoyed thinking about Lord of the Rings. Also, I heard that green bell peppers are just unripe peppers. Also Also, these look delicious, I might have to make them. Also Also Also, finally a well written cooking blog. You are right, the green peppers are unripe red ones. Once ripe they’re just as delicious roasted as they are “rraw and wrriggling, Precious.” Thank you so much for stopping in and for your ever so kind remarks. I make mine that way too but have you ever tried the poblanos that way? They are green I’ll admit, but nothing like a green bell. I have not. To tell the truth, I don’t do an awful lot with the spicier peppers beyond mincing them up for the occasional ceviche. What do you do with the roasted poblanos? They aren’t really spicy, I cut them up and put them in omelettes, use them for chicken enchiladas and things like that. Well then, I am on it! Thanks for the tip! YUM! I’m going to have to try this, looks so easy – and I’m all for that. So painless, even a Slattern could be bothered. I promise you’ll never go back to peppers from a jar.